Designed by Karl Westinger 1936. 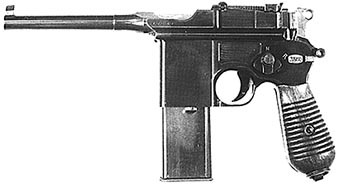 Made at Mauser Waffenfabriek - Oberndorf A Neckar. Selector switch for semi-auto or rapid-fire. Rate of fire 850-950 rpm or 15 rounds per.second. Inclusive of 10 rnd magazine.